Oxford City Hall is located at 300 Williamsboro Street, Oxford, NC 27565; phone: 919-603-1100. Photo: Thorndale, ca. 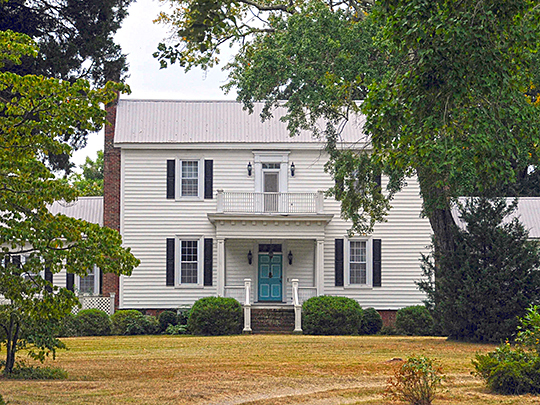 1837, 213 West Thorndale Drive, Oxford, NC. Listed on the National Register of Historic Places in 1988. Photographed by User:Jerrye & Roy Klotz MD (own work), 2007, [cc-by-3.0 (creativecommons.org/licenses/by/3.0)], via Wikimedia Commons, accessed October, 2013. The present boundaries of Granville County date back to 1746 when Samuel Benton, Granville County's representative to the State Assembly of North Carolina, succeeded in introducing a bill to divide the county into two parts, Granville County and Bute County. Bute County was further divided into Warren and Franklin Counties. At the time of the county division, the Courthouse was located at Harrisburg, a small agricultural village. Located 1-1/2 miles from Harrisburg was the plantation home known as "Oxford" which was owned by Representative Benton. At the same assembly meeting, when the County was divided into 2 parts, it was also ordered that the Courthouse be moved to a more central location. From his plantation home, Mr. Benton selected and gave to the County 1 acre of land on which the new courthouse was built. In 1812, upon order of a set of commissioners appointed by the General Assembly, 50 acres of land were platted and streets were laid off in the vicinity of the relocated courthouse. In 1816 corporate government was formed and in that year an act was passed by the assembly incorporating Oxford as a town. During the early years of the 19th century, Oxford grew into a modest educational, manufacturing, governmental and agricultural center. From its beginning, the town served as county seat of Granville County, and was the central meeting and market place for the County. Tobacco and cotton were the two chief staples raised on the large plantation type farms that were in and near Oxford. When the Civil War broke out, Granville County was one of 5 North Carolina counties with as many as 10,000 slaves. The total population at that time was 23,296. After the Civil War the old plantation economy was changed. Tobacco prevailed as the chief agricultural crop. The spread of the tobacco industry at the end of the War brought a degree of prosperity to the town. In 1865 the first warehouse was built in Oxford and a second one in 1870. During this time buggy manufacturing became an important part of Oxford's economy. Another factor which further spurred the economy and growth of Oxford was the railway line from Hendersonville laid in 1881 and another line built from Clarksville, Virginia to Oxford in 1888. These 2 lines were connected and extended to Durham. A short while later, the Seaboard Railroad was formed through a combination of many smaller railroads. Several educational institutions were established in Oxford. In 1850 the Oxford Female College was founded and erected using land set aside by Thomas Littlejohn when land for the Town was originally settled. Horner Military School was established in Oxford in 1851 by James H. Horner. It was continued by his sons and moved to Charlotte in 1914. In 1884 the Masonic Grand Lodge of North Carolina founded Saint John's College and for several years efforts were made to run it. However, in 1872, it was turned into an orphanage which is still in operation and known as The Masonic Home for Children at Oxford. City Planning and Architectural Associates, Chapel Hill, Land Development Plan, Oxford, North Carolina, 1965, prepared with financial aide through a Federal grant from the Urban Renewal Administration of the Department of Housing and Urban Development, www.archive.org, accessed March, 2011.